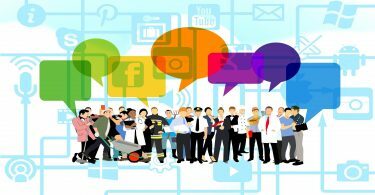 Responding to customer reviews is one of the most important, most frequently overlooked steps of building an awesome online reputation. Getting new reviews is easy if you’re using a tool like BirdEye, you don’t even have to think about it. Responding to them, however, takes more time and effort than you’d like. We get it. We totally do. It’d be great to have a huge customer service team with unlimited resources to tend to every customer’s need, but not every business has the bandwidth for that. 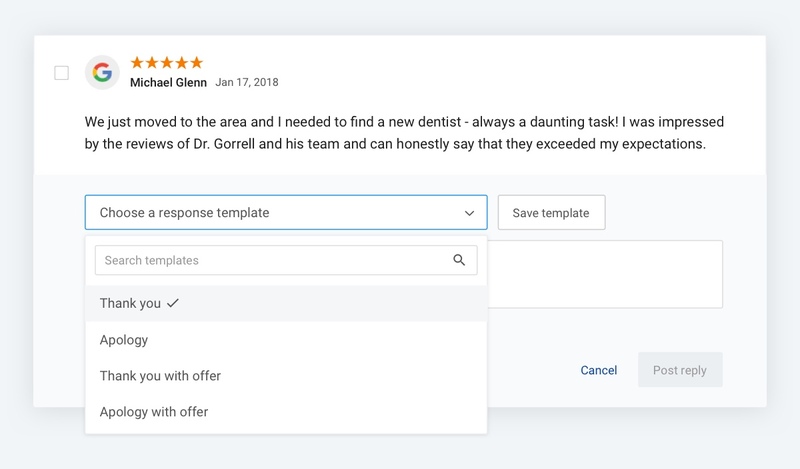 That’s why we just launched review response templates that let you respond to reviews with just a click. Everyone’s focused on simply getting new reviews, but think of it like this: you invite friends over for dinner and as they leave, one of them tells you the risotto you made was delicious, and that story you told was “just hysterical!”. Do you stand there in silence, avoiding eye contact until they leave? Or let’s say during dinner you spill wine on another friend’s shirt. Do you just pretend it didn’t happen and continue on your merry way? Why is it that both of those scenarios sound ridiculous, but most businesses fail to thank customers for positive reviews or apologize and offer solutions for negative reviews? Your business isn’t a dinner party, but the same rules apply: how you handle the first visit determines whether there will be any more. If you’re collecting online reviews for your business or you hope to start, you need to have a strategy in place for responding to them promptly — both the negative and the positive. “Strategy”. What an ominous word, right? Wrong. Here’s the easiest strategy ever: BirdEye sends you a real-time alert when a new review is posted about your business. All you have to do is select a template, click “Reply” and you’re done! Studies have shown that 53% of customers expect a business to reply to them on review sites, and 30% judge a business primarily on whether it responds to reviews. Think of that 30% as 3 people at the dinner table who watched you spill wine and walk away. They weren’t just watching, they were judging. Actively responding to reviews not only keeps existing customers happy; it also boosts organic traffic to your review site profiles. This is why, according to research, businesses that respond to reviews experience a 5% increase in review count. It’s simple: more traffic to your review profiles, more customers, more reviews! 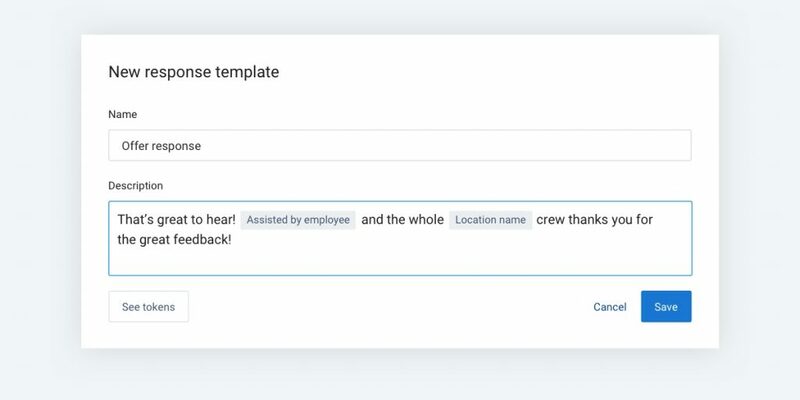 BirdEye provides you with a default “Thank you” and “Apology” template, and you can create as many additional templates as you want. “Tokens” let you automatically personalize your responses according to each individual review, so instead of just saying “Thanks for your review” or “Sorry to hear that” to everyone, you can address each reviewer by name, mention the city they visited you in, the employee who assisted them, provide a contact number they can reach you on, and more. With tokens, your whole company can use the same templates to maintain a consistent voice, while also keeping each response specific to the reviewer’s location. Oh, and did we mention all you have to do is click “Reply?”. Yeah. We recommend creating a few versions of each response type so you don’t have a string of totally identical responses in a row — this would make them all appear less genuine. Switch up the language, throw in an offer, sprinkle in some humor, get creative! You can create as many templates as you want. 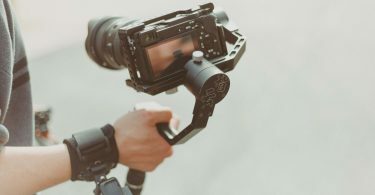 Of course, you still have the option to type out a completely custom response to your Google reviews too, and in cases where customers have a particularly detailed complaint, that is the best course of action. Yes, clicking a button is easy. But you know what’s even easier? Not clicking a button. That’s why BirdEye has also launched automatic review responses. 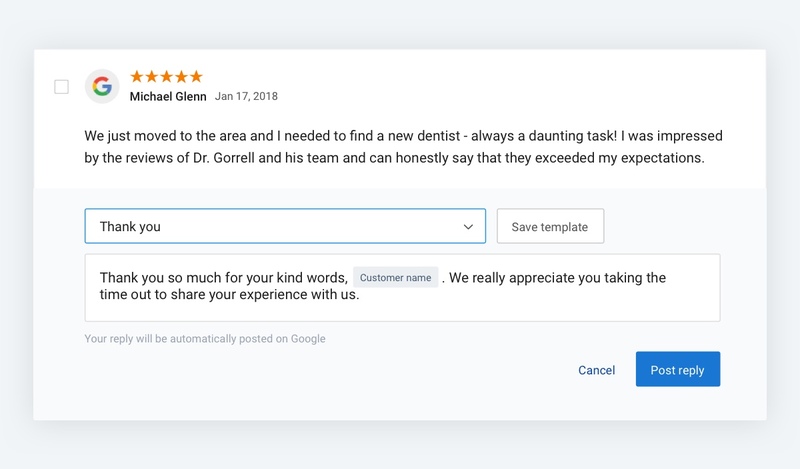 You can now create rules to post specific response templates for specific types of reviews, then carry on with your day while BirdEye handles the responding. This is a great option for sending “Thank You” offers and directing simple complaints to your support team. Running a business is hard and often complicated. Managing reviews shouldn’t be. Learn more about how BirdEye makes managing reviews easy.